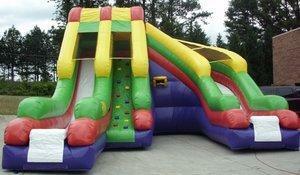 The 20' High Ultimate Helix Dual Dry Slide with hoop is the ultimate in dry slide attractions! Its bright and bold red, green, blue and yellow color scheme will draw them in, but the impressive 20 foot, amazing dual slide will certainly wow any passers by and keep them coming back for more. Riders can climb up the rock-wall style center-column and choose a left-sided straight slide with inclined stop, or choose the wide, curving right-sided slide for a new and exciting twist. With two slides and a substantial width, players will delight in riding over and over again.